Here is an example. Let’s say you need a custom headwall manufactured to help at an odd bridge embankment, or a weir storm structure with an odd inlet. The tolerances are a bit tight, and simply using something styled in 2D is leaving a lot of frustration and insecurity (I bet you rerun the same calcs 6 times of more before the project is complete, JUST so you can sleep at night). With part builder, it doesn’t have to be that way. Just take an hour (wink wink) and build the part so that the plan can be conveyed accurately in a complete form. The part modeler is a 3Dimentional parametric modeler designed to create and accurately convey solid structures and pipes for use in pipe networks. This relates to Storm and Sanitary sewer models, but some people have pushed the limit and evaluated their water utilities, modeling their valves as well. It uses 2D planes and modeling features such as transitions, paths (lofting will make sense to some of you), extrusions, constraints, and Boolean Add/Subtract. Various dimensions can be mapped to model parameters, that can be affected in the Civil 3D application through tables in the structure properties. This all sounds a lot like Inventor. Once an Inventor user creates the first extrusion, they’d probably say “Hey, this is a lot like inventor !!!”. It ain’t Inventor!!! It is not a fully functional, user friendly environment that allows all the functionality that you can tweak. Just because you can get it to look that way in the builder, does not mean that the builder will be able to convey it that way in the end. For all the strong Autocad 3D environment people out there, not much hope either. You’ll be able to navigate through it ok, but you still have to model through it’s API. I’d like to get going with this by reviewing some published Best Practices, so you can get a feel for what to watch out for. I’ll go into detail about specific things as we move along, I just want to point out some things that might be helpful. 1. Create a backup of the original/customized Pipe Network Catalog. Get everything for the category you will be working with, not just what you are working on. 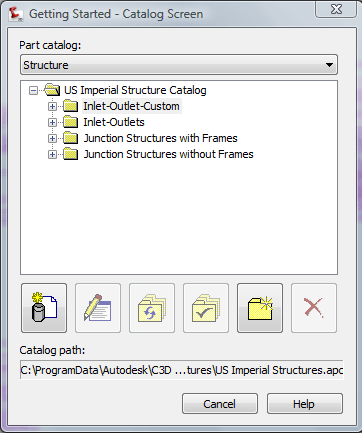 For example …\Pipes Catalog\US Imperial Structures Copy the entire thing. There are category xml fies in the root category folder that get published to when you create a structure, and you need that file set as well. Yeah, I’ll agree with that, unless you have a really good background in AutoCAD 3d environment. This doesn’t mean you shouldn’t try and learn, it just means to be careful because you can foul up some things. I started in 2006 by modifying some existing part tapers. This is partially true. Part Builder uses work planes to position and create geometry that ultimately becomes a solid model. The biggest problem I experienced hat was never addressed by ANYONE is that your geometry will not be stable unless it is created on one of the 6 ORTHOGANAL PLANES. I spent days trying to convey something that had simple 45° angles. You know I beat it, but I had to work around the problem. The statement Autodesk made about how geometry can be positioned from custom planes is terribly misleading. If you come away with anything from all of this, this should be it. If you have a headwall whose leaders are always misaligned, it is because the X axis is used to represent the pipe alignment default. If you review the Basic OEM structure, you should note the TOP plane X axis is positioned to the rear of the structure. The rear is designed adjacent to the RIGHT plane. 5. The TOP plane is KING! Sounds funny doesn’t it. Everything modeled from the TOP plane will be 100% stable and straight forward. Make sure you set the part configuration FIRST. The catalog hands down base parameters controlled by Civil 3D, and you will need these to map dimensions with. DO NOT MAP THESE DIMENSIONS STRAIGHT. If something goes wrong and you need to erase the Catalog variables you will kill half of your model. Create user parameters to buffer the input. Then you can simply enter values to user parameters, and erase the system variables safely. The next articles will have workflow and be more interesting. You may forget these issues, and you can fix them. After about 4 hours when you insert that perfect model, and it comes in scattered across the landscape, you’ll remember the last 4 statements. Use the best practice tips in the industry as guidelines, not ‘If I can work it in’ ideas. For the rest of this series, I’d like to convey the workflow creating some parts I needed for my studies, and what I found that worked well, and what did not. Keep checking back with me. If anyone wants to see something detailed during this workflow, now is the time to post it.